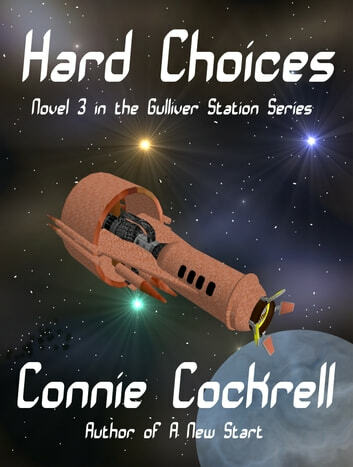 A short novel with four short stories, Hard Choices looks at life on Gulliver Station in the time after The Challenge. Weather in the Biosphere is a tale about two cousins, who make an ill-timed mistake. Methane Breathers considers communications difficulties between two different species. Growing up is full of hard choices as Cassandra Madison in The Conversion discovers. Barrie has lost his job and must play the game for his family to survive as you'll read in Dedication Day. The title story, a short novel, takes a look at life on Gulliver Station from an outsider's point of view. 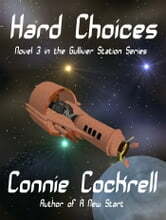 Between ships, Jolene Harris enjoys leave by herself when things go horribly wrong. Will she live to reach her new ship, The Adirondack?